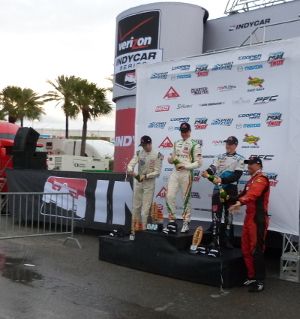 St. Petersburg, Fla. – Spencer Pigot eclipsed a strong 20-car field in this evening’s Allied Building Products Grand Prix of St. Petersburg, the opening round of the Pro Mazda Championship Presented by Cooper Tires. The youngster from Orlando, Fla., continued his form from the recent preseason Cooper Tires Winterfest, in which he won twice and started from pole in all four races. Driving the #7 Doug Mockett & Company/Rising Star Racing/Vitamin-DPro App/California Scents entry for Juncos Racing, Pigot qualified comfortably on the pole this morning, then led throughout the 17-lap race. The victory was especially sweet for Pigot, 20, as he enters his second season in Pro Mazda, coming in his home state and on a track where he had previously won three times in the Cooper Tires USF2000 Championship Powered by Mazda. Teenaged Californian teammate Kyle Kaiser secured a maximum points haul for Juncos Racing in the Team Championship by finishing second, some 2.6892 seconds behind Pigot following a 17-lap race that was interrupted by a couple of brief full-course cautions. The race, which begun a few minutes before 7:00 p.m., had been delayed from earlier in the afternoon by a severe storm warning. Kaiser, who started third, pulled off an impressive move at the first corner, ducking underneath front row qualifier Scott Hargrove (Cape Motorsports with Wayne Taylor Racing), then sneaking around the outside of the Canadian in Turn Two. Once into second place, Kaiser drove an exemplary race to maintain that position to the checkered flag. Hargrove, last year’s USF2000 champion, remained glued to Kaiser’s rear wing but was never able to find a way past. Brazilian Pipo Derani (Team Pelfrey) also was part of the battle for second place before slipping back a little over the closing laps. Kyle Connery (JDC MotorSports), from Vero Beach, Fla., took over in fifth place after Mexican youngster Jose Gutierrez (Juncos Racing) tangled with Garett Grist (Andretti Autosport) on the opening lap and later held off a determined challenge from Neil Alberico (Cape Motorsports with Wayne Taylor Racing), who had found a way past Ryan Booth (JDC MotorSports) on Lap 10. Brazilian Nicolas Costa (M1 Racing) mounted a fine comeback to ninth after also being involved in the Gutierrez/Grist incident on Lap 1. Dalton Kellett (Team Pelfrey) and Shelby Blackstock (Andretti Autosport), who also survived a spin in the early stages, completed the top 10. Jay Horak of M1 Racing claimed the Expert division honors, for drivers aged 30 or over, finishing 13th overall, just 0.2888 seconds ahead of Bobby Eberle of World Speed Motorsports. Contingency awards included the Quarter Master Hard Charger Award for most positions gained to Connery, who advanced from 15th to fifth; the PFC Award and customized Race Energy charger – the official battery of the ladder series – to Juncos Racing; the Staubli Award to Pigot; and the Replay XD Move of the Race to Costa for overtaking Horak at the kink at Turn 9a on the first restart. The green flag for Race 2 will be underway at 10:45 am ET tomorrow.